Time for entry #4 in my Food Project Competition, which (if you don’t know by now and you SHOULD know by now so haven’t you been paying attention?!) is running up until the end of August and details of which can be found here. Get thinking, get submitting and I look forward to eating! 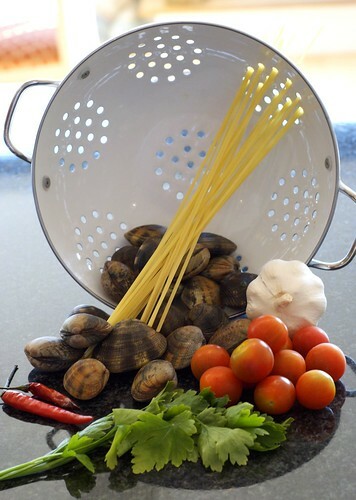 Floatykatja over at Kudocities submitted her recipe for Linguine a la Vongole, and I have to say, it totally hit the spot. I mean, I like linguine. I like clams. I like tomatoes. I love garlic. How was this not going to be delicious?! Momma Lee is my main taste tester at home, whenever I cook something she’s there with fork (or spoon, or knife, or fingers) in hand (ha, fingers in hand), ready to dig in and give me her best opinion. Momma Lee is also very critical of food, so when she says it’s tasty you know it’s pretty darn tasty. 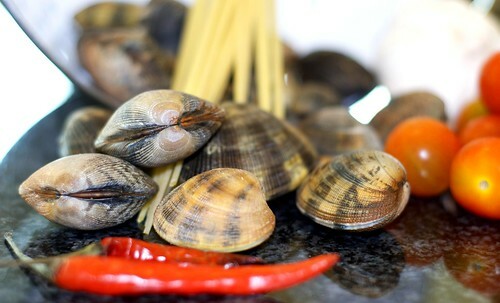 Spaghetti a la Vongole is extremely popular in Italy, and apparently Italy is the largest exporter of clams. It usually comes with a thin tomato sauce, clams and garlic, and, as is fairly obvious in the name, is often served with spaghetti. I think it’s better with a slightly thicker noodle, however, so I appreciated Floatykatja’s linguine substition. Another popular inclusion is chilli – in our house we certainly love it with chilli, hence my slight alteration! This was so simple to make, it took practically no time at all, and even though I gave Momma Lee a MASSIVE bowlful, she polished it off and stared wistfully at the pot on the stove which had the rest I was saving for Brother. In fact, she so wanted some more she even boiled up the rest of the linguine and threw it into the pot, just so that she could eat some more! Floatykatja used pre-prepared clams from a jar, but because I’m all about buying from and supporting local fishmongers, butchers, bakers and candlestick makers (okay maybe not that last one, but if we had a local candlestick maker I’d be well in there! ), and because in my opinion there is nothing better than super fresh produce, I went down to the fishmonger’s and bought a good couple of handfuls of fresh live clams. So storing fresh live clams. They need to be used preferably the same day that you intend to cook them (I’ve heard you can leave them for three days in the fridge, but I think that’s just tempting gastroentiritis) but if you buy them in the morning and you don’t intend to cook them in the evening, how on earth do you keep those suckers alive and happy? I’ll tell you – get a colander, dump the clams into said colander, get a couple of paper towels and soak them in cold water. Squeeze the excess water out so that they don’t drip, place over the clams, colander on a plate/bowl to collect any liquid, and into the fridge until you’re ready to use them. Now a little warning – if you put the clams into the freezer they’ll die. If you put them in fresh water they’ll die. So make sure the fridge isn’t at a freezing cold temperature, and just don’t mess with the clams. Mmkay? If they’re open when you buy them, give them a little tap on the shell and if they don’t close discard them – they dead, yo. Similarly, when you cook them if they don’t OPEN discard them – they dead too, yo. When I was making my Vongole I got a little freaked out because literally none of my clams opened, and because they were all closed when I bought them I thought, “Oh noes! My local fishmonger totally ripped me off and sold me DEAD CLAMS!” Oh Jackie of Little Faith. What were you forgetting? These babies need TIME. Time to do their thang! After a quick panicked phonecall to Momma Lee I slammed the lid on, whacked the heat up and left them to ruminate for a few minutes and suddenly – pop! Pop, pop, pop! All of my little clam babies snapped open. They did it all at the same time – it kinda sounded like when popcorn starts to go in the microwave. Panic over, om-nom-nom. 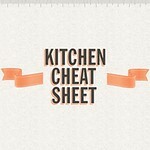 Okay, so here’s Floatykatja’s recipe. I recommend adding a bird’s eye chilli or two to this for a real kick – trust me, it’s so worth it. 1. Bring a pot of water to boil, add a glug of oil and about a tsp of salt. Throw in your linguine. 2. Meanwhile, in another pan, melt 1tbsp of the unsalted butter with a glug of olive oil (the olive oil stops the butter from burning). Add the garlic, chilli and salt to taste (you don’t need much) and give it a quick stir to combine and stop the garlic/chilli from burning. When aromatic, throw in your clams, slam the lid on, whack the heat up and leave for about 5 mins or so. When the clams all pop open give it another minute. 3. Remove the lid and add the cherry tomatoes and a slosh of white wine. Let bubble and reduce slightly. 4. By now your linguine should be al dente – drain, reserving about 1/2 cup of pasta water, and then return to the pan. 5. Add the Vongole sauce to the pasta, and if it looks a little dry add some of the pasta water, then give it a good toss through. 6. Add the remaining 1 tbsp of butter, toss again, transfer into heated bowls and grind some pecorino flakes on top (if using) and freshly ground black pepper. 7. Devour. Seriously. Just stuff your face until you can’t move. Perfection. There we go then. Thank you Floatykatja for the recipe! Don’t be scared to use fresh produce, especially seafood – the end results are totally worth it, and it’s not exactly a great deal of work to begin with! Also, just a head’s up, don’t serve this with parmesan cheese, or anything like that – seafood and cheese = bad. An Italian friend told us that and he would know! That’s all for now, until next time – peace and love. 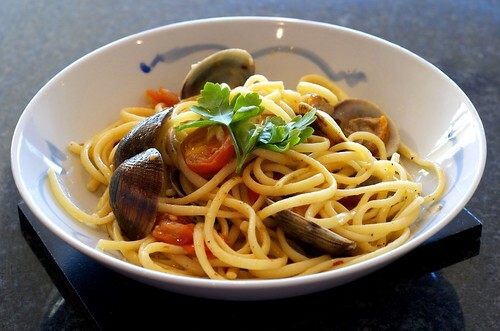 Pasta and clams is one of my favorite dishes… and this just looks wonderful! The pictures are great! What a beautiful dish. I loved seeing all the ingredients stacked up next to each other. Pasta and clams is one of my favorites too! Yum. Monet – thank you lovely =) I like taking photos of the "mise" as they call it, it's nice to see what's actually going into your meal!